Read More On "Understanding My Mombasa Beach Tier Ratings & Experiences In Kenya (TIER 1 - Premier, TIER 2 - Deluxe Or TIER 3 - Value)"
The Mombasa Beach Tier 1 (Premier Experience) rooming & meal rate in Kenya starts from US $450 to US $750 per person/night sharing on average with the very few topping to around $1000+ a night for a highly exclusive, upmarket, upgraded rooms and private beach or island experience. The cost is generally all inclusive of rooming, breakfast, dinner, Kenya hotel taxes (VAT) and service charges. All inclusive hotels also have all meals included, snacks and select drinks. Please check with us for complete inclusions for your preferred all inclusive accommodation as they each differ. 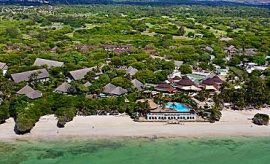 The Mombasa Beach Tier 2 (Deluxe Experience) rooming & meal rate in Kenya starts from US $250 to US $450 per person/night sharing on average with the very few topping to around $600+ a night for a highly exclusive, upmarket, upgraded rooms and private beach or island experience. The cost is generally all inclusive of rooming, breakfast, dinner, Kenya hotel taxes (VAT) and service charges. All inclusive hotels also have all meals included, snacks and select drinks. Please check with us for complete inclusions for your preferred all inclusive accommodation as they each differ. The Mombasa Beach Tier 3 (Value Experience) rooming & meal rate in Kenya starts from US $150 to US $250 per person/night sharing on average with the very few topping to around $400+ a night for a highly exclusive, upmarket, upgraded rooms and private beach or island experience. The cost is generally all inclusive of rooming, breakfast, dinner, Kenya hotel taxes (VAT) and service charges. All inclusive hotels also have all meals included, snacks and select drinks. Please check with us for complete inclusions for your preferred all inclusive accommodation as they each differ. 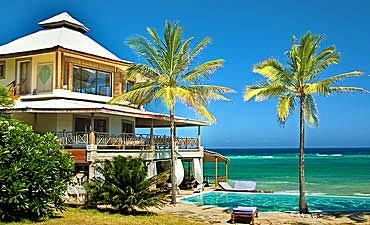 - The above Mombasa pricing is a guide only to your specific Beach Tier accommodation choice in Kenya. Single room supplements are extra. Children under 12 years have a further discounted rate. All accommodation rooming prices are subject to availability and seasonally variant dependent on the month of travel. 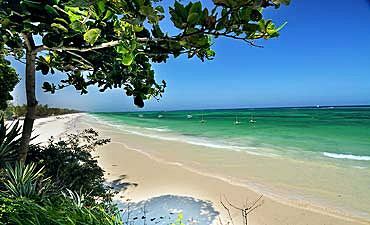 Bury your toes in the soft white sand while watching soothing waves lap the Mombasa shoreline. The aquamarine of the Indian Ocean stretches as far as the eye can see, meeting the blue sky on the horizon. 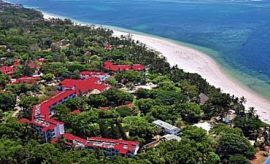 The South Coast is where you will find the highest level luxury accommodations, few of which are The Funzi Keys, AfroChic Diani and also Alfajiri Villas where Brad Pitt and Angelina Jolie have stayed. 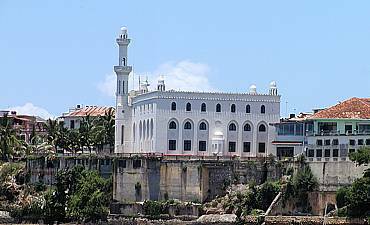 Mombasa Island and its surrounds offer varied tour attractions, from 16th century built Fort Jesus, old town area, dhow dinner cruise, fishing to snorkeling, diving at Kisite and Mombasa Marine Parks. 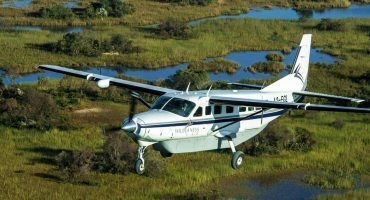 When combined with a wildlife safari, the two dry seasons from July through October and January until February are the best times to visit Mombasa as the sky has few, if any, clouds, and sunshine is abundant. I want to let you know we had a wonderful time in Kenya and everything went a planned! We also enjoyed Pinewood Village by the ocean in Mombasa. Thanks so much for all you and your company did for us. From the moment we arrived in Mombasa, there were transportation officers there to collect us. Great trip, and AfricanMecca were really organised and gave us all the information. Thanks for everything! My daughter's and my trip that AfricanMecca arranged to South Coast Mombasa, Diani Reef Beach Resort was awesome. We laid on the beach quite a bit, but did manage to take in camel rides and also snorkelling. 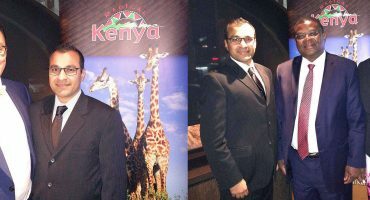 Dear Raza, Just a note to let you know that my daughter and I had a wonderful time in Kenya. In, fact I enjoyed my time in Kenya so much that I changed my plans to spend a few days in London and spent an extra two days in Mombasa. 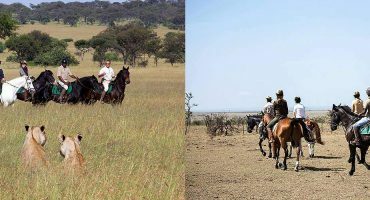 When beach vacationing in Mombasa, we recommend experiencing some of the surrounding Mombasa attractions and cultural activities after heading out on your Kenya safari to Amboseli, Masai Mara, Lake Nakuru and Naivasha. ARE YOU PLANNING AN AFRICAN TRIP TO MOMBASA IN KENYA? 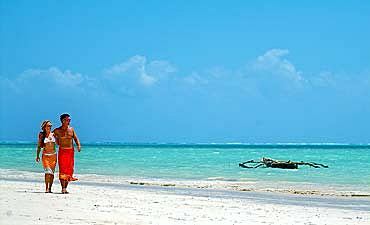 HAVE YOU VISITED MOMBASA FOR A BEACH VACATION IN KENYA?